A Russian trawler which fled with two Norwegian fisheries officials on board after they inspected its catch has reached Russian territorial waters. The Elektron is heading for the port of Murmansk, tracked by four Norwegian coastguard ships and an aircraft on the other side of the sea border. 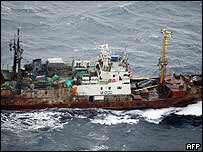 The boat was intercepted on Saturday for suspected illegal fishing and told to go to Norway. But it unexpectedly changed its course and headed for Russian waters instead. It is being escorted by the anti-submarine ship Admiral Levchenko, to prevent the Norwegians entering Russian waters. The trawler was stopped in the Svalbard archipelago in the Arctic, in waters claimed by Norway. Norwegian authorities said the Elektron had been using illegal fishing equipment which violated quota rules on fishing catches. The Norwegians have been trying without success to stop the Russian boat. But another Russian trawler which accompanied it, the Grigory Arlashkin, is waiting for help after a net thrown from a Norwegian aircraft wrapped round its propeller. The boat's captain was quoted as saying in a radio report that his crew was in danger because of a storm in the area. Oslo has complained that it is getting little help from Russia to resolve the incident. Russian Foreign Minister Sergei Lavrov said Moscow did not recognise Norway's right to police Arctic waters. "The incident took place in the Spitzbergen area, which the Norwegian side has proclaimed a fish-protection zone. We have never agreed to the parameters that the Norwegians set unilaterally," Mr Lavrov said. On Tuesday, Russia said the situation would be resolved through diplomacy. It said its forces would release the Norwegian inspectors. Norwegian military spokesman John Espen Lien said the Norwegian navy had held back from intervening because of bad weather. He said Norway was not worried about the two inspectors, "but you have to admit that the situation is unusual". A spokesman for the trawler's owner, the Union of the Fish Industry of the North, told the Interfax news agency that he believed a conflict over fishing quotas was behind the incident. Norway and Russia have land and sea borders in the Arctic, and disputes over fishing rights have become increasingly common.